I am really fond of Adobe AIR apps as much as I am fond of Mozilla Prism. I love running certain web applications on desktop and Adobe AIR goes much farther than just that. Twhirl – a Twitter client built on Adobe AIR platform is one brilliant example of its power. Unlike Mozilla Prism, which lets you run web applications as desktop apps, Adobe AIR goes further in creating different interfaces and functionality by working with the APIs provided by the web application. This is where Netflix’s recent release of their REST API comes in. The developers at SitePen inc. have developed a new Adobe AIR app – Queued that interacts with NetFlix’s API. 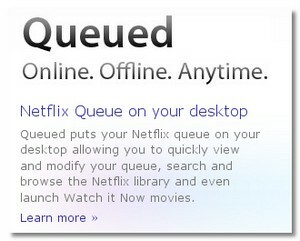 Queued brings your Netflix queue to your desktop allowing you to quicky, view and modify your queue. It also lets you search for movies and add it your queue. You can even browse the library and launch instant Watch It now movies right from your desktop. No need to login to Netflix and launching the browser to do it. Adobe AIR lets you run Queued even in background so you can often get into Netflix queue and do what you want without logging in every time and waiting for the web pages to load. In fact, Queued can even notify when Netflix has received your movies and when they ship your movies. In Windows and Mc OS X, you can right click on the dock/tray icon and choose ‘At Home Mini-Queue’ to view information on what movies has been shipped quickly. Netflix has garnered my respect with their efficient service in delivering movies via post as well as via streaming. Queued is definitely a great prototype of what Adobe AIR & Dojo toolkit can do with some nice APIs. Exactly the intention with which the developers built this. In fact, Queued is a open-source, BSD-licensed software. So anyone can get the source code and provide suggestions, bug fixes and contributions to this project. I reviewed Netflix InstantWatcher which lets you find the movies you want quickly just a while back. If I could find a roku coupon, I may even go out and buy a Roku Netflix box or this LG Netflix streaming Blu-Ray player. Finally, if you are spending money on Netflix, you might as well make sure you are using your Netflix subscription to it’s fullest by checking out your usage patterns. No question that Netflix’s move with their API was smart – I think they benefit from the useful extra services like Feedflix and Instant Watcher that have resulted – not to mention being featured on New York Times and Rotten Tomatoes review/movie pages. For a new approach to choosing what to watch with Netflix, you might have a look at Jinni (http://www.jinni.com) – we’re a new service with search and recommendations powered by the Movie Genome. This sounds great for managing our movie list. My husband and I always have a large list and sometimes we forget what is on it. I also will be working and a movie will pop into my head I would like to see. I don’t want to go through all the hastle of logging on to Netflix and then I loose it. This way it would be easy to just add it to my queue.